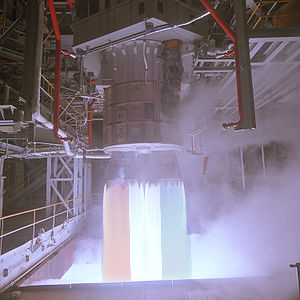 NPO Energomash has begun experimenting with a technique to add colors signifying American patriotism to the exhaust flames so that each launch may serve as a reminder. MOSCOW, Russia (AP) – NPO Energomash has announced that their successful Ракетный Двигатель-180 (known in the west as the RD-180) will be renamed the “Reagan-180”, freeing it from further threat of trade restrictions imposed by the United States. “Some senators in the United States”, announced NPO spokesman Dmitri Moiseyevich, “have expressed concerns related to this reliable, mission-proven RD-180 engine. After careful consideration, we are proud to announce that this high-performance propulsion device shall now be known as the Reagan 180, named”, he added, “after the brave President and Actor respected by so many over… there.” He continued to note that a careful reading of attempted restrictions on the engines has revealed that the limitations on use for defense payloads is keyed off the name of the engine itself, not the country of origin. The Reagan-180 American Freedom is fueled by kerosene and liquid oxygen, and the NPO Energomash rep noted that from a statistical standpoint, every flight almost certainly uses at least some oxygen that had at one point been breathed by the founders of the United States of America. “Is propelled by freedom!” he enthused.